The video "A day in Iceland" is a creation of Krzysztof Ciapala, a colleague from Danmar Computers. It is part of the series developed in Budapest in early April 2016 during the training event on Digital Story Telling. The video tells the story of an trip through an unrealistic, moon-like landscape of Iceland. It is a story on the secret views and the mystery of nature, and its everlasting beauty. It is a story about how the discovery of the wildness is important and last over time. 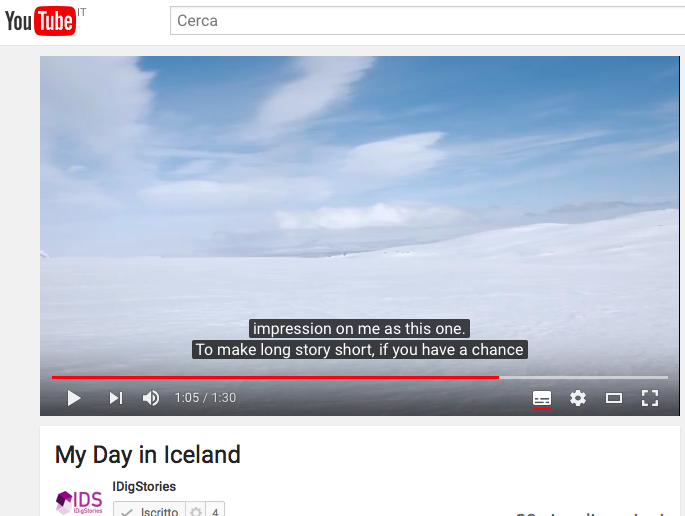 To favor the view for person with hear-impairment, all videos are available with English subtitles which can be selected directly by the viewer with bottom at bottom right of the video. Everyone can support us on our share of the Digital Story Telling methodology and praxis by sharing our videos & posts with your contacts, &, of course, "like" us, if you'll like.